Exercise 2 - Adding Data Validation To Excel Worksheets - Event 1 Software, Inc.
We will be utilizing the Entry Grid created in Exercise 1. If you no longer have a copy, you may download it using the link below: Download GLEntryGridExample.xlsx Also, since we will be utilizing Office Connector Query Designer, please make sure you have access to either an evaluation or full license of Office Connector Query Designer. If you need to obtain an evaluation license, please contact your Sage Business Partner or your Sage Customer Account Manager. This exercise will demonstrate creating a Data Validation List that can be used to select valid Account Numbers from General Ledger in the Entry Grid. Navigate to Sheet2 of the workbook. Click cell A1 and enter: Chart Of Accounts. Click cell A3, and click Query Wizard on the Office Connector toolbar. On the first step of the wizard, select GL Account and click Next. Since we will not be applying any conditions or specifying any other options, click Finish. A list of Account Numbers and Account Titles should now be displayed in Columns A and B, starting on Row 3. Select the range of cells containing the Account Numbers. This range starts with cell A4 (the first account number) and continues through to the last cell in Column A containing an Account Number. Enter AccountList in the Name Box and press Enter. Navigate to Sheet1 and click the cell located in the first data entry row of Column A. Select Data Validation on the Data tab. Note - This is the label assigned in the previous section to the range containing the Account Numbers. Click OK to complete the Data Validation. Note - Since the entry grid was created as an Excel Table, the Data Validation settings that were applied to the first row are automatically copied down to any new rows that are added as data is entered. Limit the length of a text value. In cells that should contain dates, limit the input so that only dates can be entered. Also, control the range of dates that can be used. In cells that should contain numbers, limit the input so that only numeric values can be entered. Also, control the range of values that can be used. Use custom validation by writing an Excel formula that returns TRUE (if the data is valid) and FALSE if it is not. 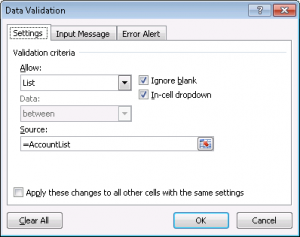 Control the messages that a user will see when the selection is in a given cell or when an invalid value is entered.